Anders takes pride in converting a blank moment into an expressive encounter. Anders Tomlinson is a complex and complete artist that merges different creative disciplines into story telling. Working freely with painting, graphic art, sound, video, photography, words and a curious nature Anders explores process. To communicate becomes the art form. His paintings communicate with Anders. They suggest, cajole and inspire. 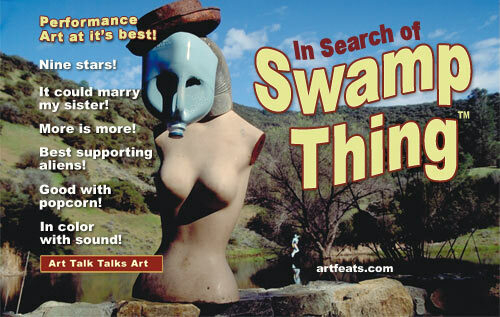 If you wish to contact Anders Tomlinson about his art, or art films, send an email to tule-lake.com. It is Anders Tomlinson’s goal to have his work shown. There are many groups that are complete and ready for exhibition. If a gallery was interested in a particular group, such as Recycles or Cosmic Migrations, Anders would sand their finish coats and take one last pass. Welcome to the Anders process that can span decades with a single brush stroke. A rare moment with an empty workbench, and the studio on his weekly finish-coat-day. Welcome to his work bench. A typical week will have at least twelve paintings in progress. Anders averages two to three completed paintings a week. See Anders Paints for more background on his paint process. Visit Anders at work in his studio and see the 2010 art and 2011 art he finished. These were very good years. Anders filming Aliens from the Planet Serious at the feet of a Naked Shiva. The art films of Anders Tomlinson have been in progress since 2000. Gary Ruble, Bob Ganey, Claysonics, the Mad Dogs, Doctor Dirt and Pig Man. A series of films documenting artists skilled at creating visual images, music and humor. Where are humans going? Where did humans come from? Is it, or does it, matter? 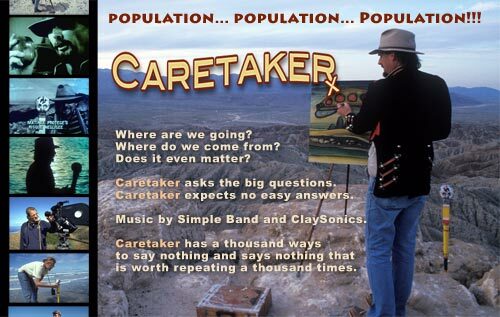 Take a hike with Caretaker videos and exercise your pedestrian power. There is no better time than now to investigate Mesmerize Yourself! videos. Enjoy! Anders works on Scout as Yellow Chin offers encouragement. 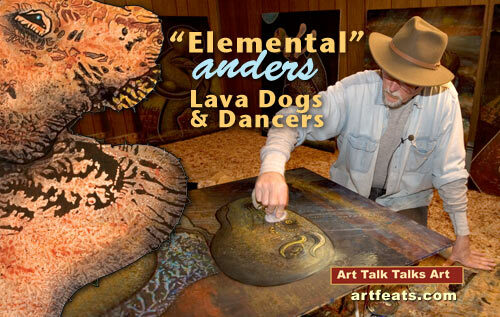 Attend an art showing of the Lava Dog and Dancers at the Ross Ragland Theater in Klamath Falls, Oregon. 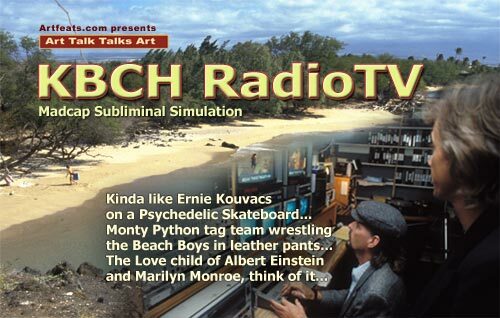 And a special feature includes clips from the legendary KBCH-RadioTelevision out of Del Mar, California. AtomicSonics performs Habitat and… the soundtrack. It is hard to imagine all of this action could fit on one DVD, but it does in moving color with stereo sound. 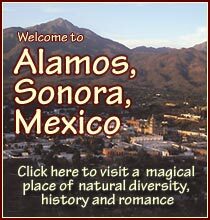 As time move on take a moment and visit Elemental videos, think sand in a martini glass. Are you mammal enough to handle PigMan Videos? Doctor Dirt thinks you are. Come experience KBCH RadioTV videos, and practice your eye, ear, laugh coordination. There is always more that we see or hear, Just ask Bob, he knows. 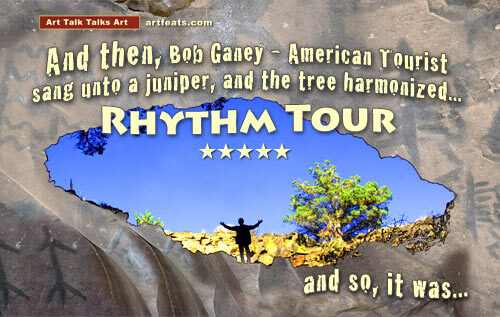 Bob Ganey American Tourist does the fair, Ganey Brothers reunite, Environmental Reporter investigates a dairy, Buddy and Me take a walk, Bob writes a song and dances with old bones. Pig Boy and Donna sing Don’t Fence Me In, Lizard Alley soundtrack and more, much more. anders watercolors art-tars caretaker dr. dirt cosmic migration Techno mesmerize yourself! 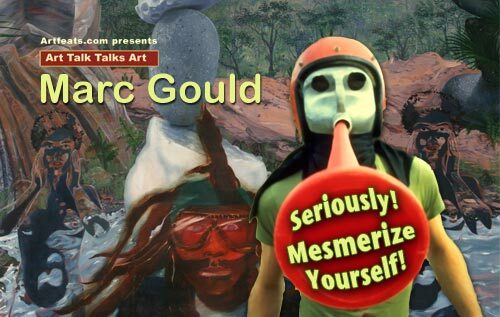 chiloquin Anders Art art studio kbch radiotv Anders Paints Anders Gallery pigman anders paintings relationships Art Talk Talks Art recycles Anders Tomlinson Anders photos san diego art Art Talk Dvds Marc Gould Mesmorize Yourself!